Karen is a Certified Money & Business Archetype coach, a Time To Think Facilitator, a Certified Professional Co-Active Coach, non-profit leader, and spiritual-seeker. Her passion is helping individuals, families, couples, social entrepreneurs, and mission-based organisations wake up to their value and talents, so that they can contribute their very best to the world. She helps people and heart-centered organizations achieve their goals by releasing the suffering and tension around their relationship with money. With over ten years’ experience in nonprofit leadership & fund development – combined with her own path around money – make her intimately familiar with the struggles that people and organisations face. From 2014 to 2016, Karen studied with Lynne Twist, focusing on the global container of toxic assumptions we hold around money that keep us stuck in fear and ignorance. She was also mentored and trained by Deborah Price of the Money Coaching Institute, whose approach combines psychological principles with practical financial advice. 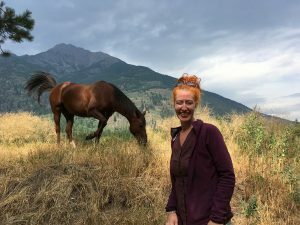 Karen’s deepest influence comes from her teachers and the founders of Clear Sky Center, in British Columbia, Doug Duncan and Catherine Pawasarat. Through their teachings, she has developed a consistent practice of generosity, which is considered the building block of a healthy relationship with money. As a money/business and life coach with over 20 years’ experience practicing and teaching meditation, she has worked extensively with big blocks such as fear, dissociation, and betrayal that are common in people’s consciousness around money. Karen has lived and worked in Europe, Japan, Brazil, and North America, which has given her a rich cultural and global understanding of money issues. Seeing the pain these cause – and the great difference people can make when free of them – has made her fiercely committed to helping people come to a place of flow and empowerment around money. When she’s not engaged in her work, you’ll find her playing the Japanese bamboo flute, reading about art, design and history, and walking around feeling and sensing the world around her.